Spirax Subject Notebooks can be used in the office or school environment. All subject books are 7 hole punched for use in 2,3 or 4 Ring Binders. The pages of the notebooks are divided into subjects or sections by the use of pocketed cardboard dividers. The pockets can be used for holding loose leaf material and handouts. A4 Sized Notebook with 250 Pages - 4 Dividers and 8 Lecture Note Pockets. 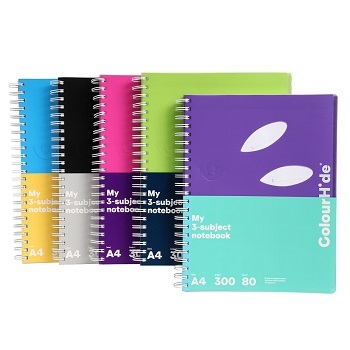 Pack of 5 Side Bound spiral subject notebooks. Fun and Bright A4 Subject Notebooks perfect for the office, school or home. A4 Sized Notebooks with 300 Pages - 2 Dividers for 3 Subjects. 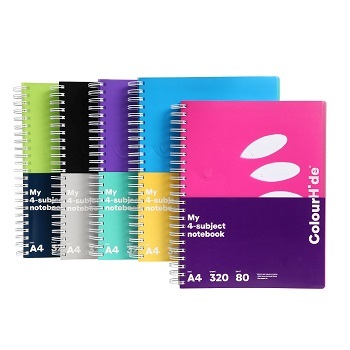 Individual Side Bound spiral subject notebooks in assorted colours. A4 Sized Notebooks with 320 Pages - 3 Dividers for 4 Subjects. 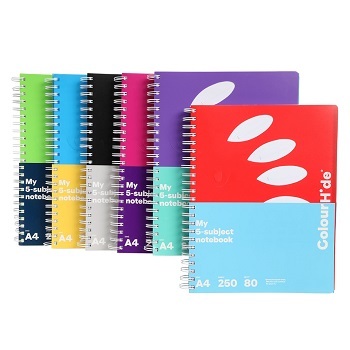 A4 Sized Notebooks with 250 Pages - 4 Dividers for 5 Subjects.